This document is aimed at living history groups who do demonstration events at medieval fairs and the like, and want to cook their own food, in a period way, as a part of that display. We’re still learning and trying out new recipes, techniques, trying to make things better and easier, so this document is continually updating. Hopefully, it’s a good starting point for other people who want to try the exciting and rewarding (and delicious!) world of medieval campfire cooking. Queue no longer for the gozleme stand! 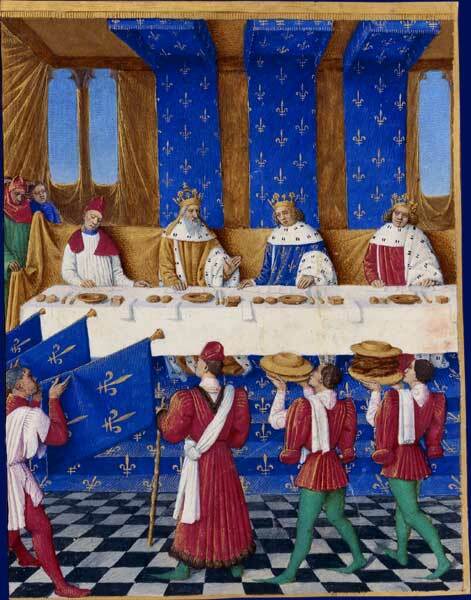 Image is Banquet given in Paris in 1378 by Charles V of France for Charles IV, Holy Roman Emperor (left) and his son Wenceslaus, King of the Romans. Each diner has two knives, a square salt container, napkin, bread and a plate; by Jean Fouquet, 1455–60.